Using a small-caliber muzzleloading rifle to shoot squirrels is a traditional hunting method in the Southern U.S. which is still practiced. These rifles started out first as flintlocks that frequently were about .32-caliber, although increasingly larger .36s, .40s and .45s were also used if the hunter thought he might have an opportunity to take larger game. Always with a thought towards economy, the smaller calibers provided more shots with less expenditure for powder and lead. Performance from round-ball rifles on larger game improves dramatically when ball size is increased. In the YouTube video that accompanies this post, a much-expanded .32-caliber ball was recovered from a squirrel. This bullet had struck bone in the skull and flattened out to nearly .45-caliber. 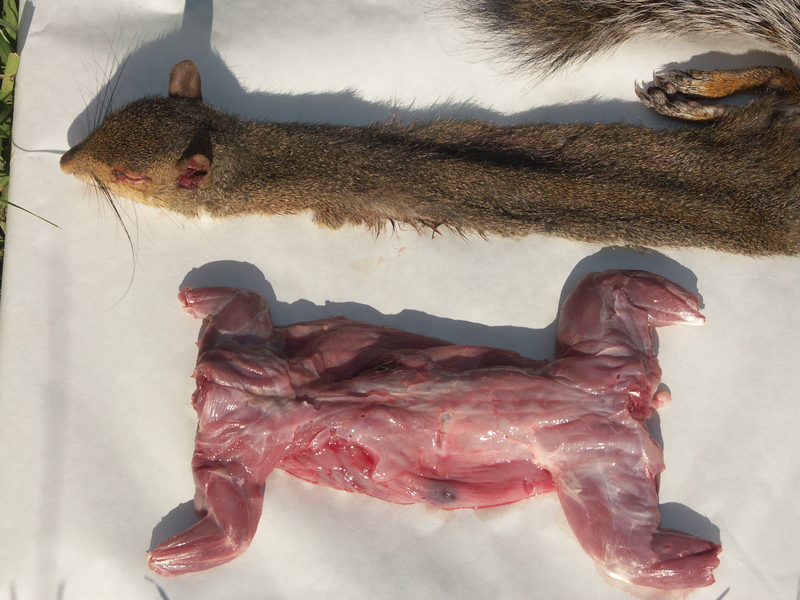 It was retained by the animal’s tough hide and fell out as the squirrel was being skinned. This bullet would have given miserable performance on a deer or hog. For round-ball guns that might be used to take squirrels and larger game, I prefer .45s as the smallest caliber that I would use on deer. Although the .45s are a bit big for squirrels, they will work as combined small game-deer guns. To prevent having to remember two sets of trajectory figures and sighting in between hunts, I shoot everything with a deer load which usually consist of 70-85 grains of FFg and a patched .440 round ball in most replica .45-caliber rifles. While this use provides valuable practice with the gun before deer season, the economies of using less powder and lead are lost. The Traditions Deerhunter Small Game Rifle, which was furnished by the manufacturer and used on the hunt, is a typical modernized side-lock replica rifle that uses an aluminum ramrod, synthetic buttplate and adjustable polymer front and rear sights. I found that the front sight was too low for my load of 20 grains of FFFg and a patched round ball and inset in a small South African coin that I trimmed to proper height to zero the gun. Even though I do not see iron sights as crisply as I once did, I can still do reasonable work with this gun; although attempting all head-shots with these crude sights would be a futile exercise. Although the squirrels were not very cooperative on this hunt, I did have one shot opportunity and took the animal with a single shot. The previous day I had gone out with exactly the same result for a 4-hour morning hunt. I have a large population of squirrels, but they were not moving much in the late August heat. I think most of them were looking for a branch to stretch out on to catch some cooling breezes. The squirrel cleaning section of the video was added to supplement my August 13 radio show on “The Backyard Sportsman” where I discussed squirrel hunting, cleaning and cooking. This video may be seen at http://www.youtube.com/watch?v=Jjwn4CDyI9M&layer_token=e0c8bd1eb5d57eef . It is too long to post on this blog. It shows and discusses the Traditions .32-caliber rifle as well as takes the viewer through the squirrel-cleaning process. The squirrel took the shot through the head. The head was so mangled that I cut it off before I started the video. One thing not mentioned in the video is that it is much easier to remove the hides from squirrels, and all game, while the animals are still warm with body heat. On this particular hunt, I shot the squirrel near the house and put it in the refrigerator before resuming my hunt to keep from carrying it for hours in the August heat.